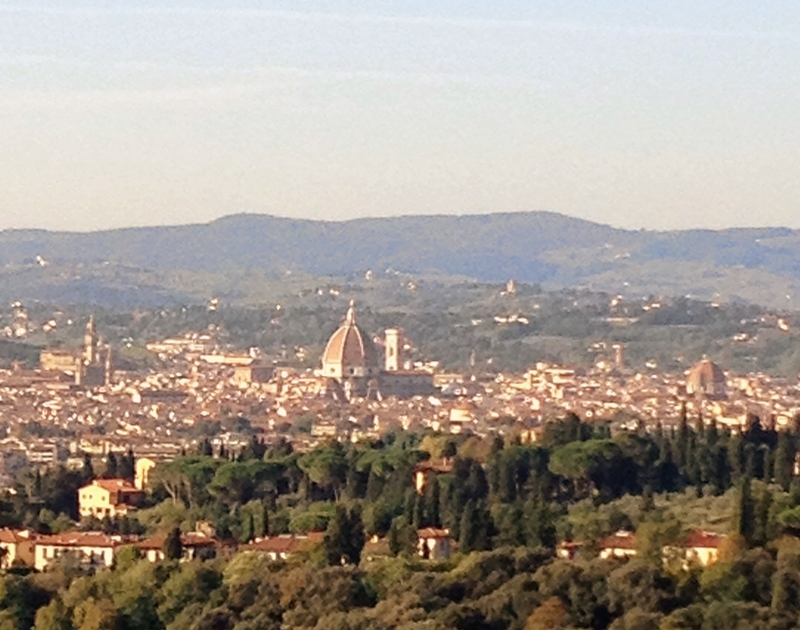 We Go to Florence | Sprezzatura, Y'all! Florence is about an hour and a half away from Anghiari, so it was easy to put that on our list of things to do with Myra. We thought it would be good to have that be our first overnight trip because it’s easy to get to and it kind of sets the stage for Italy, in our opinion. Italy has a very, very long history and is known for many things. The Estruscans, the Roman Empire, concrete, Ferraris – and the Renaissance. The Renaissance changed the world in so many ways and opened the collective mind to look at things differently. So we set off to walk in the footsteps of the Renaissance greats and have our senses delighted by the treasures that live in Florence. We stayed at our favorite place, Pensione Bencista. Loyal readers will remember this as the launching pad for our Swiss adventure. First stop was to see David. I think seeing that before you see anything else really puts everything into perspective. When you enter the Accademia museum, you turn to the left and look down a long corridor to the David standing at the end. Along the corridor are a series of unfinished sculptures by Michelangelo called the prisoners. 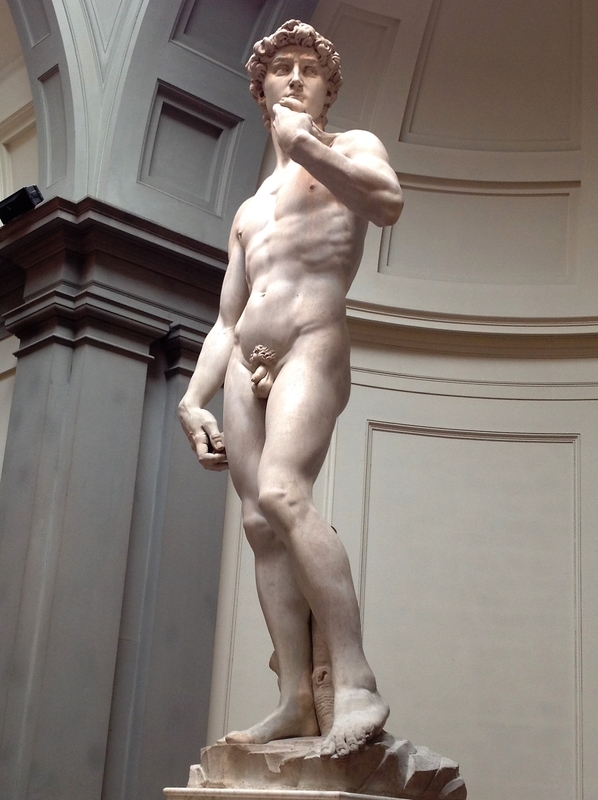 Michelangelo felt like all he was doing through sculpture was freeing the form that lived in the marble. He was setting it free. These prisoners line up along the hallway struggling to break free of their marble prison like the masterpiece at the end did. They didn’t quite make it and are spending perpetuity in a state of dreamy half-life. Enough out of their prison to take form, but still in enough to be mysterious. Then there’s David. Fully realized and so lifelike that you feel like at any moment he will step off his pedestal and hurl that rock at the cowering giant. 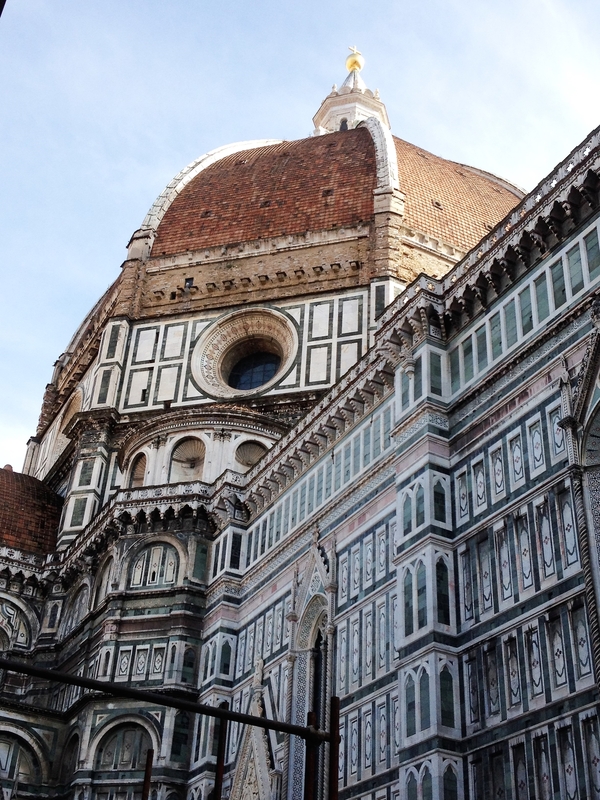 From there we went into the Duomo and Baptistery. Places like no other on earth. The Duomo is beautiful inside, but it’s the dome that makes it such a work of art, both inside and out. From Bencista, you can see that dome rises above the other red tile roof tops and it stands as a symbol of engineering, ingenuity, and artistry. Really the embodiment of the Renaissance. After that, we were overwhelmed by it all and decided to go back to Bencista to contemplate what we had seen. And have wine. We sat out on the beautiful terrace overlooking Florence and a wind came up and made what was a gorgeous day quite chilly. 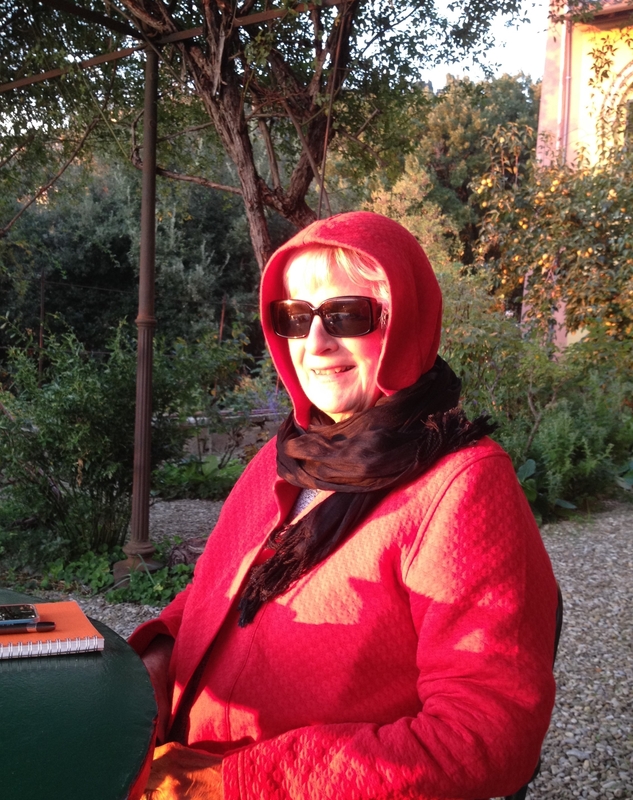 Myra was bundled up like a bright red Greta Garbo and looked as elegant as Greta ever did. It was clear and bright, but got increasingly chilly. We stayed out as long as we could and then went into one of the many sitting rooms till the dinner bell rang. The next day was perfectly gorgeous. 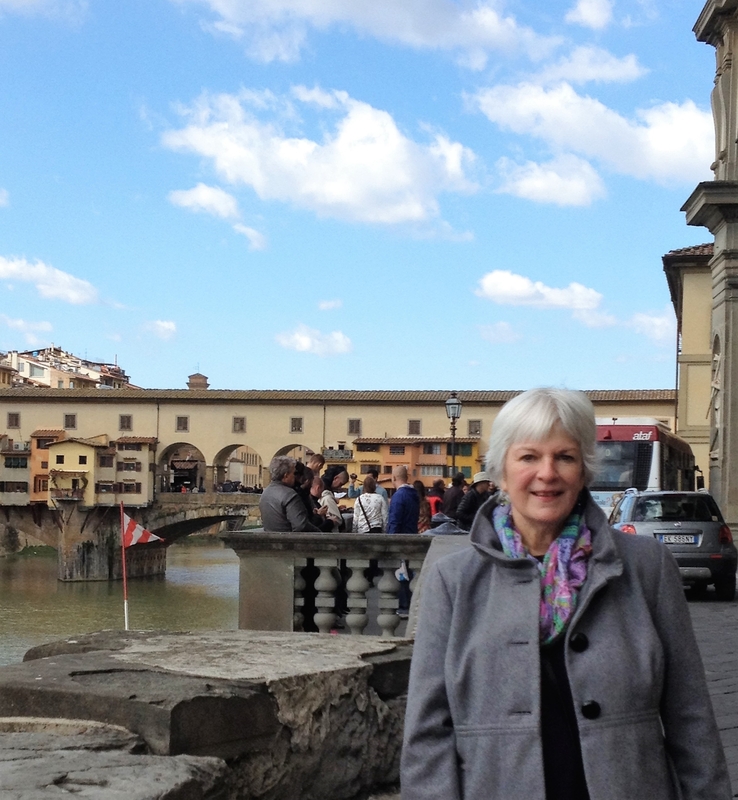 After a nice breakfast at Bencista, we took the bus down to Florence and went to the Bargello museum, Santa Croce church, crossed the Arno and had lunch, then over the Ponte Vecchio and finally to the Uffizi. Long, full day. Lots of wonderful art, architecture, food and sights to behold. Florence is an incredible place and you can feel the creative vibe there. Visual art, performance art, culinary art – it’s all there in every nook and cranny of the city. After this enlightening and exhilarating day, we treated ourselves to a nice dinner. Big surprise, huh? 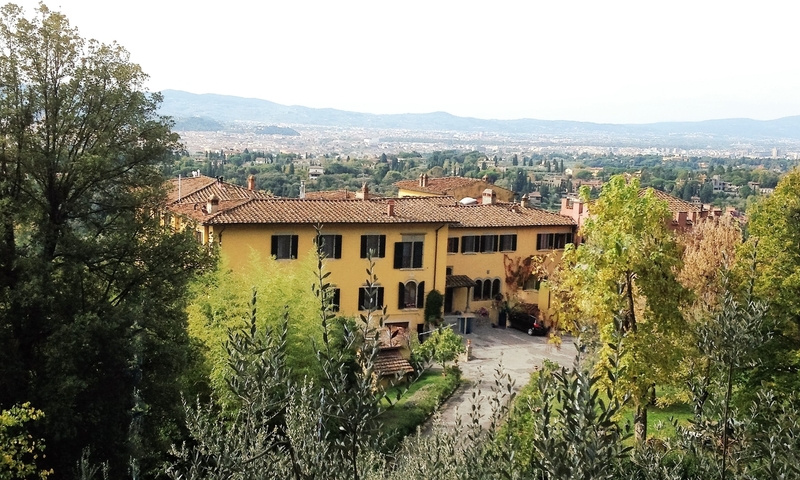 We went up to Fiesole to a restaurant that we’ve been to many times, Il Polpa. It’s all about meat. They have other things, too, but it’s the meat that they’re known for. It was the perfect ending to a great day. Florence is an inspiration. It’s a place where you can feel a connection with the past and a glimpse into the future. It gives you hope and comfort and helps you put things into perspective. It’s a living museum and a cathedral for the universe. Murder, mayhem, catastrophe, war, pestilence, beauty, creativity, intellectualism, expression, and innovation all converged here and informed future generations. Books and art were burned in the name of piety, but in the end freedom of expression prevailed. It’s a place of irony, where the dark is celebrated as much as the light. It’s classic and modern and teaches us that those who went before us still manage to influence us – it’s up to us to choose how.